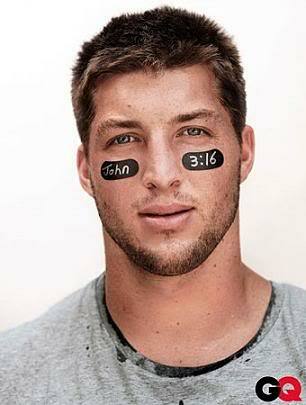 Tim Tebow started sporting John 3:16 way back during his college career. Yesterday Tim Tebow Tebow passed for 316 yards against the Steelers, completing 10 of 21 pass attempts — meaning he passed for 31.6 yards per completion. Bloomberg reported that the Broncos’ win, which snapped a three-game losing streak, came as Tebow ran for one touchdown and passed for two others, including an 80-yarder to Demaryius Thomas that ended the game on the first play from scrimmage of the extra period, eliminating the six-time Super Bowl champion Steelers. The overtime drew a 31.6 television rating. The Steelers total time of possession: 31 minutes and 6 seconds.